Martin Mallett was the kindest of men. I mean THE kindest of men. I was privileged to photograph him twice and last week to attend his funeral. Martin, who died at the age of 64, was an achiever, the highest achiever in unconditional love, endeavor and friendship. 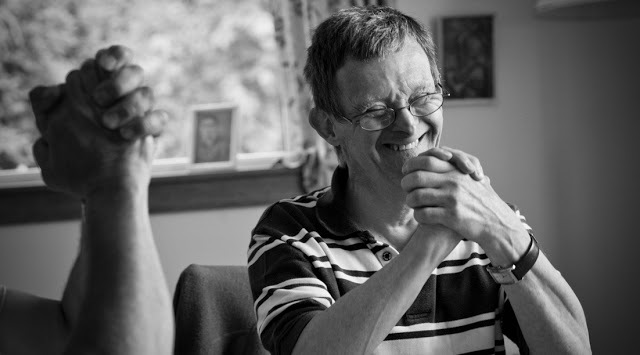 It’s stigma that suggests that someone with Downs Syndrome should limit their life goals. Martins parents and family had the courage to ignore that advice. They allowed him to fly, to pursue his dreams, to lead the life he wanted to live. The most moving eulogy came from the Church Rector who spoke of how Martin would regularly ask to be blessed. Martin would then turn to him and offer to bless him in return. As the service ended my admiration for him reached a peak and I felt a little guilty. I could never be as kind and good as Martin but he’s made want to try. A remarkable person who leaves a kinder world behind through all he met, who all understand it’s what you do for others and the modesty with which you accept life as it is, that is to be most admired. This seems such an important message today on World Downs Syndrome Day. In an increasingly selfish World it’s selfless people like Martin, humble to the core, who can remind us that perhaps, just perhaps its everyone else who has the wrong priorities.